The cost of adoption can be the most intimidating factor of choosing to grow your family by adoption and rightly so. Adoption costs can be as low as a few thousand to as high as $60,000. So how do people that adopt handle their finances? How do people actually afford adoption? Read on to find out the 14 things you need to know when you’re trying to afford your adoption. And don’t forget to get to join the affording adoption group for more tips and tricks. 1. How Much Does Adoption Really Cost? The cost of an adoption depends on two things: what type of adoption are you pursuing and where the adoption will be taking place. Then there are few other factors, like birth parent expenses, travel fees, home study costs, and other legal fees. It’s important to ask an agency you’re looking at to provide a specific breakdown of fees since they can vary slightly from agency to agency. According to this study, the average cost of newborn adoptions in the United States is $37,000. The costs associated with this type of adoption often involve agency fees, so it’s possible that you can save money by choosing a private adoption, if your state laws allow. This cost can also go up depending on how much you decide to spend on extra advertising, like listing an online adoption profile, or if you have specifications (i.e. you prefer to adopt a daughter than son). Additionally, adoption fees will increase if your adoption is done in a different state than you reside. The average cost for an adoption outside the United States is $42,000 according to this study. This can also vary depending on which country you choose to adopt from. Often this type of adoption is the most expensive because you are working with three divisions of government to legally adopt (your state government, the federal government, and the country you are adopting from). Because you’ll be required to visit your country, most likely multiple times, there can be varying travel costs (plane tickets, lodging, food, etc). Because of the nature of foster care adoption, many adoptions from foster care can cost less than $1,000. Many times families can be reimbursed for the adoption of a foster child. If a child has special needs you may also qualify for government assistance. Talk to your local Child and Family Welfare to find out what assistance may be available for your child. If you choose to pursue adoption by using an agency, it’s important to ask an agency you’re looking at to provide a specific breakdown of fees since they vary from agency to agency. Some agencies have a fixed fee which means the you don’t have to pay more even if the agency has to put in more hours. Other agencies operate on a sliding scale, meaning they will charge you based on your income. Some agencies will charge just based on the work they put in. It’s up to you to choose the agency that will work best for your financial circumstances. Although this may not necessarily be a financial cost, it is one that should be considered when pursuing adoption to grow your family. The financial costs are taxing on the mental state for many. You will likely face high levels of stress. It’s important to account for these mental “costs” as you plan for your adoption journey. Your mental health is just as important. How Much Does it Cost to Adopt a Child? A Guide. 2. Is Adoption Actually Affordable? In a short answer, yes! If you don’t believe me, watch this video filled with adoptive parents sharing how they afforded adoption. Look, it can seem to be an impossible task. But if you can have patience, the drive, and a little creativity, you can absolutely afford to grow your family through adoption. You need to sit down and have a serious discussion with your spouse and sort through your finances. Find and write down all the costs that will be associated with your adoption journey. If growing your family by adoption is a serious priority, you will find a way to make it happen. There may some hiccups and changes that you face, but if you make your plan and adjust as needed, you can press forward. Here are some tips to help you organize your finances in preparation for adoption. Start a budget and stick to it. Start applying for grants/loans for adoption. Ask your employer if they offer adoption assistance. Pick up a second job or downsize your home or car. Make a list of your adoption expenses and save your records for the adoption tax credit. 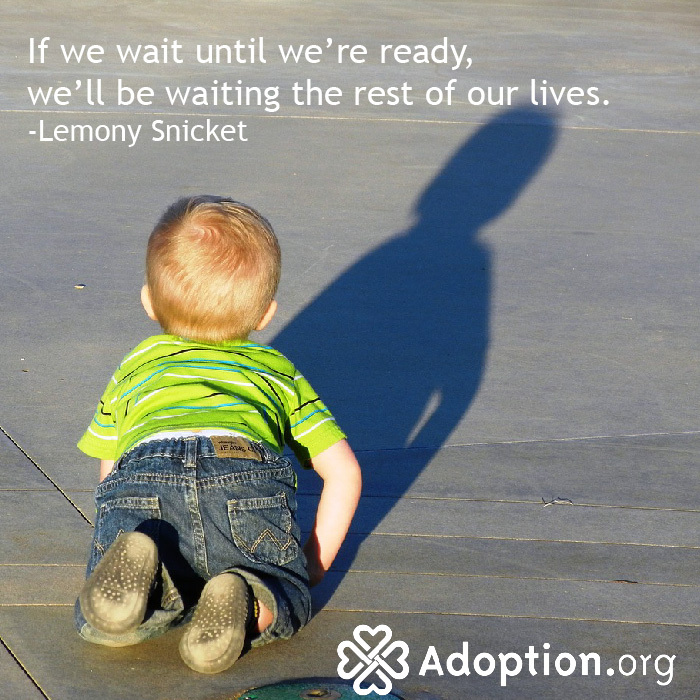 Decide what type of adoption you are pursuing. How to Adopt, the Least Expensive Way? Why does Adoption Have to be so Hard and Expensive? And if that’s not convincing enough, check out this blog post that can help you explain to yourself and others that adoption is possible. “I would adopt if it weren’t so expensive” will no longer be an acceptable excuse. Read on for more tips and tricks to help you pay for the many fees you’ll encounter during your adoption journey. Many families cannot outright afford adoption, which is completely understandable given all the costs associated with an adoption journey. That is where cutting your costs, watching where you spend your money, and sticking to a budget can help. You may be surprised to see where your money goes and how it adds up once you start tracking your finances. But this is an excellent way to put your money toward something that you have your heart set on. First, start by making a list of your fixed (things that don’t change from month to month) and variable (expenses that change from month to month) costs. That means writing down your rent or mortgage, grocery bill, electric bill, insurance, entertainment, etc–all the things that you spend your money on. You and your family will have to decide areas that can be cut down. Of course this doesn’t mean cutting your grocery budget so that you starve, but rather staying in and eating out less. What kind of budget you set will depend on what you’re comfortable with and what’s practical. Setting a budget is to help you watch your expenditures and start saving money for your adoption. You may not see an immediate effect, but if you can commit to it, you will see results from your efforts. You may consider finding temporary employment somewhere to help with this huge financial undertaking. Along with some of the other financial assistance, a part time job may be just the thing you need to more comfortably raise funds for your adoption. Many retailers offer seasonal employment around the holidays. Check around to see what might work for you. To some, fundraising is an obvious choice to help families afford adoption. To others, it isn’t. It’s up to you to decide if financing your adoption through fundraising is right for your family. If you decide to fundraise, be prepared for some intrusive questions and disagreements. Though this should not stop your fundraising, you should know how you want to respond so as not to be caught off guard. And think of this as a warm up for all the intrusive questions you’ll get once you’re an adoptive parent. When do you need to have the money by? Are there certain deadlines you have to meet? How much of your own money can you afford to put toward adoption? Once you’ve answered these questions, you can start the more fun part of fundraising: coming up with fundraising ideas! An Adoption Auction: Ask around local businesses and friends to donate goods and/or services to your adoption. Hold a silent or live auction. Host a Garage Sale: Maybe it’s not the most inventive idea around, but you can make it fun. Have family members or friends donate items to add a super aspect to your garage sale. Sell Homemade Goods: You could do a bake sale, or sell cupcakes, cookies, trinkets and/or jewelry; all are practical options. Some have even taken a hobby of theirs like photography or calligraphy to create goods for sale. Baby Bottle Donations: Hand out plastic bottles to your friends and family and ask for them to put their spare change in the bottles toward your adoption. T-Shirt Sales: There are several business, like Amazon, that allow you to put your own designs on t-shirts and you can put the profits toward your adoption. Yard Work: Many find it easier to donate to a cause if they’re receiving a little something in return. Round up some neighborhood friends and offer some yard work services like mowing lawns and pulling weeds in exchange for donations. A Run/Walk: Hold a run or walk in your neighborhood or local track. You can have people pay to be in it or have them reach out to donors to donate per lap they run/walk in a certain amount of time. Holiday-specific fundraising: If you’re fundraising during any holiday seasons, try creating a theme to go along with it. You could sell Valentine’s Day cards, hide easter eggs, or make ornaments for just a few ideas. There are a million ways to fundraise for an adoption, but it won’t be as effective if you don’t give yourself a little marketing and rely a bit on your network and community to help you out. Be sure to reach out on social media to get the word out about your event. And take comfort that there are those that want to support you and your family on this adoption journey, if only you let them know. Once you’ve completed your fundraiser, don’t forget to write the thank you cards! Perhaps a family photo with a sweet note would be a cute idea to thank all of your supporters. They say it takes a village to raise a child, and that saying works the same when it comes to running a fundraiser. Don’t be discouraged! You can do it! And if you don’t believe me, watch this adorable boy fundraise money for his own adoption. And if you’re still stuck on adoption fundraising ideas or questions check out the forums below to learn more. One last thing to consider for fundraising is using a platform for crowdfunding. Adoption.com has an excellent platform you can use that is specifically geared to crowdfunding adoptions. For some, crowdfunding can feel a little strange for some, it does seem to be asking for a hand out, but what would you do if you saw a friend crowdfunding for their adoption? If the answer is help them out, either through contribution or word of mouth, then it’s likely there are others you know that would do the same for you and your family. There are three types of loans that can assist in adoption: perpetual funds, adoption lenders, and specialized bank lenders. Perpetual funds typically have no interest rate and need to be paid back by a set date. Adoption lenders are organizations that are specifically created for funding those that want to adopt. They can have high interest rates if the borrower has poor credit and it’s important to check that the organization you’re borrowing from is credible and trustworthy. Some larger banks offer loans designed for hopeful adoptive parents so be sure to ask your local bank to see what they offer. You can read this wiki entry for more information on loans. Keep in mind that choosing a loan to finance your adoption means you need to have good credit–at least that will make it more likely you’ll be approved. A lot of lenders want to see good credit because there won’t be any collateral in an adoption loan like in a car or home loan. Some families decide to loan from their 401k. You can read how other hopeful adoptive parents have done so here. If you think a loan might be right for you, you can get more information here. Because grants don’t have to be paid back like loans, they’re an appealing way to pay for your adoption. However, grants are often for specific children, countries, or any other specified criteria that the organization wishes. They are also incredibly competitive. You may have all the qualifications but still not receive the grant. Grants rarely cover all the adoption expenses, but they can make a dent in your never ending pile of adoption bills. There are lots of organizations that offer grants to help cover adoption grants, it’s just a matter of finding the ones that you qualify for. There are many grants that are specific to certain demographics, like teachers or military personnel. You should also check with your employer to see if they offer any grant programs for adoption. Some employers will match their grants with your funding up to a certain limit. It’s recommended that you have your home study completed before applying for grants. The organizations that give grants to hopeful adoptive parents want to see that you are serious about your adoption. They may also require a small application fee for the grant you’re applying for. Be sure to thoroughly research any grants that you are applying to. There’s no point wasting time applying for a grant that you don’t qualify for. You should also save any files or documents that may make applying for other grants easier and quicker. And it never hurts to ask your adoption agency if they offer any grants–some larger agencies do! If you’re interested in applying for grants, you may consider checking out these organizations that offer adoption-related grants. Simply put, the adoption tax credit will reimburse you for nearly all adoption expenses up to the amount listed below. The nice thing is that nearly all adoption expenses qualify–it’s up to you to keep track of your expenses though. Make sure to keep receipts and document expenditures from things like travel, lodging, meals, court costs, attorney fees, agency fees, and even things like state-specific requirements for adopting, like installing safety devices around your home. All of these things can be reimbursed through the adoption tax credit. For 2017, the adoption tax credit maximum limit is $13,570. If your modified adjusted gross income is equal to or lesser than $203,540, you are eligible for the full amount. Your tax credit is reduced if you are within $203,540 – $243, 540. If your modified adjusted gross income is more than $243,540, you will not receive any of the tax credit. These numbers will likely fluctuate from year to year as the cost of living changes. We recommend you visit a tax professional to make sure you qualify for the adoption tax credit. The adoption tax credit does apply for international and domestic adoptions. You cannot claim the credit for surrogacy or stepchild adoption. You can also claim the adoption tax credit if you have a failed adoption of a specific child, if you’re adopting domestically. If you adopt a child with special needs, you may find that you still qualify for the entire credit, even if your expenses do not meet or exceed the total credit. You can claim the adoption tax credit by filling out Form 8839 and attaching it to your Form 1040 or Form 1040A. This is a federal tax credit and you may wish to check your state to see if it offers a similar credit. Check here to read more about the adoption tax credit. You may also find this Adoption Tax Credit Guide helpful. Debt is somewhat of an accepted part of life. Maybe you’ve gone into debt for a new car or come. You might have school loans that you’re working on paying off. So maybe the thought of adding one more debt to your list is just not going to happen. That’s not a bad thing to want. So, how do you stay out of debt when you’re adopting? First, know that it is possible to adopt without debt. It just might mean that things move at a slower pace than you anticipated. Be sure to read the sections on grants and fundraising to get ideas for what you can do to stay out of debt, but still afford adoption. And of course you need to know about budgeting and reevaluating your own spending habits. Start with those things and you’ll be off to an excellent start. It never hurts to start saving early either. You may consider cutting back. Some families have downsized their car or home to be able to put that money toward adoption. Think of these cut backs as an investment in your family and child’s future. Check out this article for more ways to adopt without debt. You may find the discussions listed below useful on your journey of staying/getting out of debt in our adoption journey. And don’t forget to leave your questions or comments, too! It’s a sad part of the adoption world, but unfortunately scammers exist all over the adoption world. As you continue reading this section on scams, remember that it is not wrong to have a trust, but verify policy with expectant parents and agencies. You are the only one that can protect yourself against scammers. Scams can be from your agency. Check reviews of agencies before choosing them as your agency. It should be a place that others have used before and should carry the necessary accreditations as required by your state. Keep in mind that if it seems too good to be true, it probably is, especially when it comes to international adoption. If an agency or adoption facilitator promises to place a child from a country that is banned either by the U.S or the foreign country, they are operating illegally and may be part of child trafficking. It should also be a red flag if an agency is placing large amounts of children from a country that is difficult to adopt from. She refuses to work with your agency or lawyers. She insists on doing things all her way. She lacks any kind of social media presence. Or her social media presence is nearly nonexistent. Check to see if she has friends or interact with other online. Things tend to be overly dramatic in her life. She’s constantly needing money, fighting with friends or family, on the verge of losing her home, etc. this could be a hint that something’s not quite right. She’s constantly canceling or postponing face-to-face meeting with you or your adoption professional. Additionally, check forums and groups to see if this is familiar person or story to other couples hoping to adopt. If you’re part of Parent Profiles, you have access to a private community that may know of previous scammers that have reached out to them. Remember to differentiate birth parent rights from scams. A birth mother has the right to decide to parent, even after she has given birth. This does not make the entire relationship a scam. It is also okay if a birth mother changes her mind and chooses a different family to place her child with. If you’re interested in learning more about birth parent rights, click here. If you become the victim of an adoption scam, stop all payments and cancel any checks you have outstanding. You should contact your local authorities, your lawyer, and the administrators if you have an online profile. If you’re not sure where to report a scammer, check out this forum thread for some good options. And you can watch an adoption investigation here. If you have been scammed or you are worried about being scammed, don’t let those things entirely detour your adoption journey. They make take your time and finances, but it shouldn’t stop you from growing your family. Be educated and stay smart as you interact with others in the adoption world. Keep in mind that there are many good people that want to help and be kind to you. You don’t need to outright accuse people. It’s okay to have feelings of mistrust, but do your research and you will certainly find the right people to help you on your adoption journey. Even if you don’t work for these eight companies with the best adoption benefits, your employer may still offer a superb adoption benefit for you and your family. The type and amount of assistance will vary from employer to employer. Your company may reimburse you with a lump sum after the finalization or only pay certain fees. Many employers will reimburse itemized expenses up to 80% of the cose with a pre-determined ceiling. This is also a good time to check with your employer about parental leave when you have adopted. If you’re company does not offer any adoption benefits, you may consider sharing this information with them to change that. You can see what others have experienced with their employer adoption benefits in the following discussions. And don’t be shy about asking your own questions or addressing concerns you have. When/how did you tell your employer you are planning to adopt? Do you have adoption assistance thru your employer? If you’re an active member of the military you might be eligible for $2,000 in financial assistance. You’ll need to check with the appropriate base personnel to check what the current adoption benefits are offered. If you adopt a sibling group, you may be eligible for up to $5,000. However, keep in mind that you must work with a nonprofit adoption agency if you want to qualify for the financial assistance. Some fees that qualify for reimbursement include agency fees, legal fees, placement fees, and medical expenses. Birth parent expenses can be a tricky, uncomfortable discussion for personal and legal reasons. It’s common to ask why expenses should be paid and what expenses can be paid. You may wish to hear from a birth mother about birth parent expenses and you can do so here. The reality for some potential birth parents is that they do not have the financial means necessary to afford the costs that come with pregnancy and eventually a child. While there are many stories of scams (read section nine for more on scams), many potential birth parents really are struggling to pay for the costs of living. Financial assistance may be just the thing to help them have a better pregnancy and reduce stress. Of course, it is important to keep in mind that no hopeful adoptive parents are obligated to pay for ANY birth mother expenses. However, if you choose to provide financial assistance, you should check your state’s regulations on birth parent expenses. You can check here to see what is allowed and what limits are put on the expenses. Be sure to proceed with a third party, be it agency or lawyer, to ensure that the assistance is ethical. Not every birth mother is looking for financial assistance. Many women are able to utilize state and federal options to help cover some of the expenses that come with pregnancy. Your adoption professional should be able to guide your potential birth mother to the right resources. Should I pay for Birth mom expenses when we have a visit? Maybe an unexpected expense would be advertising to be found as hopeful adoptive parents. If you choose to hold a profile with a marketing company, like Parent Profiles, you can choose to add on better advertising options. But if you’re DIYing it, there are tons of options out there, but like all parts of adoption, they will depend on your budget. Talk ahead of time what you’re willing to pay for and what option will be best for you and your family. Actual marketing costs will vary greatly depending on the route you choose. It can be anywhere from free to a couple thousand dollars. Take time to do research on what kind of advertising will work best for you. You might consider Facebook advertising, Google Ads, or good old word-of-mouth to get your advertising needs met. Creating a blog or Facebook page about your adoption journey can also be a good way to advertise your hope to adopt. There are free options for both of those, so they can be budget friendly. You should also consider advertising costs for your fundraisers. An internet presence is good to have for any fundraising event, though you may not need to have paid advertising. You might need to pay for some supplies like flyers or banners that advertise for you. 14. What are you actually paying for? All of these can vary greatly depending on which type of adoption you are pursuing and where you are adopting from. Because of the variable costs, it can be hard to know the final cost until you’ve completed the adoption. More expenses can occur if errors are made or home studies expire. What Is Included In The Cost Of Adoption? Adoption Agency Fees: Where Does the Money Go?